On the way back from France last spring, driving north from our place in the Pyrenees, we stumbled on a village fair filled with local people and businesses proudly peddling their wares. Look at these beautiful glossy Lemon Sole…. you can always tell a fabulously fresh fish by the slime…which sounds terrible but is really true. This March has yielded a few really sunny days and although cold, bitingly so at times, there is nothing like tipping your face toward the sun after a long British winter. So, off we went for an afternoon on the coast, a really good bracing walk along the beach, snack in the mighty fine Old Neptune Pub. I think Dad would have approved………. The bonfire of all things food that burns within me was undoubtedly sparked by my Dad. For as long as I can remember Dad spent time in the kitchen – and to be fair, more time than was spent by the average bloke in those days. Dad was no average bloke! A hard upbringing as a child, tales of pulling a milk cart around Ipswich to deliver in the early hours. Buying a Mars bars with his wages then handing the rest of his hard earned salary to his Mum. Merchant Navy then Royal Navy, diving under vessels to check for limpet mines – wished I’d paid more attention when we did manage to eek those stories out of him! 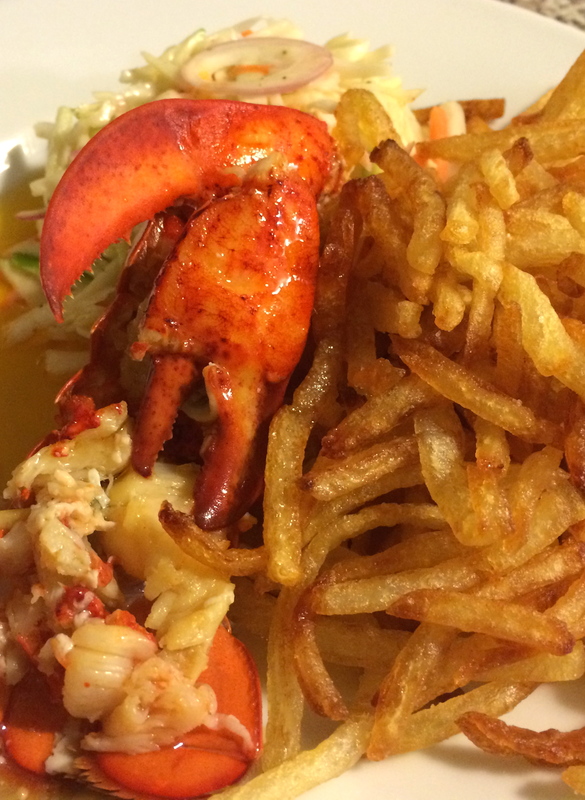 It was the week before Christmas…. Rocket and I do not get much ‘us’ time over the Christmas period, not a complaint but a statement of fact. When does the holiday start? When we arrived at the shack in France on Sunday, we were aghast at the way the place had become overgrown with weeds. An exceedingly wet spring and early summer have meant that things had got completely out of control. I’d be the first to say there are pros and cons to having a home overseas, and when all is well there is a huge sense of satisfaction and well being that comes from emersion in another culture and all that brings along with it – but a gardener I am NOT. This coupled with the usual arrival issues, like creepy crawlies everywhere and a distinct lack of hot water, can detract from the experience if you let them. We have been working now in baking heat since we arrived on Sunday to get the place habitable, and we have just about got to a manageable level, we have storms and rain predicted for tomorrow but that won’t dampen our mood. So this is the moment when I look around and the home is cosy, the outdoor areas are useable, and this is when it’s all worth it. 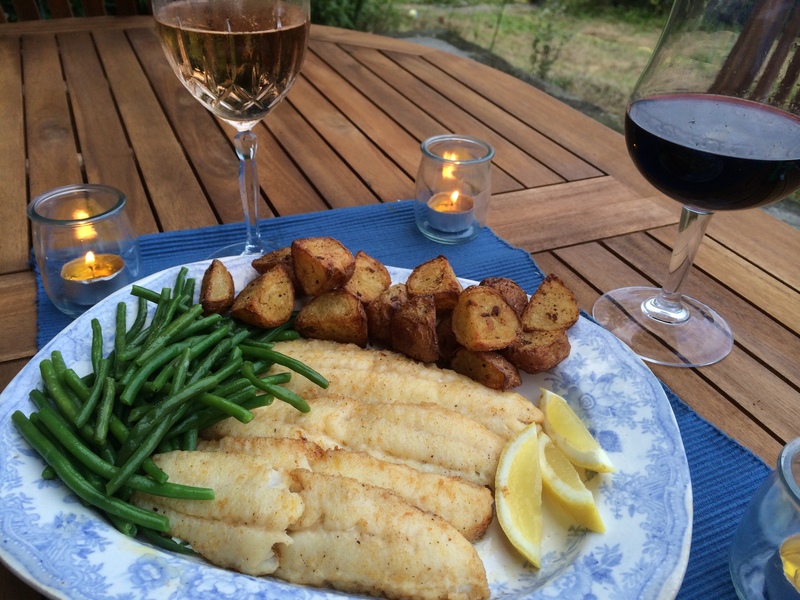 We sat out on the terrace tonight and had the most delightful supper of pan fried whiting (Merlan in French) with some green beans and garlic roast potatoes. Whiting is a great sustainable fish – it has a beautifully clean flavour and makes an excellent alternative to sole or plaice. Awkward and City arrive with us tomorrow and we will chew the cud over a few beers and enjoy our time together. I write this blog as an escape, so I write truthfully and from the heart, but that means that I don’t focus on the less great things in life – on purpose. For that reason, it probably sounds at times as if I’m constantly out and about and don’t have a care in the world! I just wanted to say that I love my friends and family very much, and value them beyond measure – all of them, never more so than when they are having difficult times. Having the place in France has meant we have had an opportunity to spend quality time with those we care about, laugh, drink and laugh some more, a bit of cooking thrown in. So, for all the weeding and bugs to contend with, right here, right now, it has been worth the journey.